Nineteenth Century Colonial maps of Van Diemans Land, or Tasmania, as it is now known, simply mark a patch of the North Coast east of Pipers River as Low Sandy Shore. The golf course at Barnbougle Dunes runs along this shore, in between a wide complex of dunes that extend behind it. On this pristine coastline, 80kms north of Launceston, architects Tom Doak and Michael Clayton have designed Australia’s best seaside test. It takes some getting to, even for mainland Australians, but its reputation is growing. Presently the bulk of the golfing traffic is either wide-eyed locals more used to up-and-down-the-paddock golf or touring enthusiasts from Hobart, Sydney and Melbourne. Doak, paired here with Victorian professional and designer Mike Clayton, is a well-travelled and cerebral architect and accents his courses with idiosyncrasies drawn from the world’s classic courses. Elements of these are present here, not in a Las Vegas style pastiche, but in a much more indirect manner in which the course is laid out in sympathy to the twists, humps and folds manifested by the retreat of the sea over thousands of years and the action of the prevailing winds. Barnbougle Dunes is the closest thing to a seaside links as exists in Australia. The holes are routed through the dunes, some as high as 100 feet. It is an odd day when there isn’t a zesty breeze to contend with, normally from the west which means you head into it immediately. The fairways are smart enough but not over cultured. They retain every warp and fold of the land on which they were placed and a few more besides. Many of the greens flow in a continuation of the surrounding land. This is a golf course made upstairs, as the saying has it. 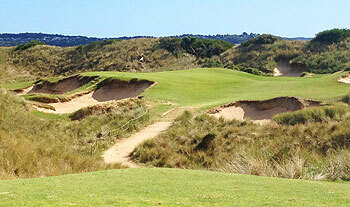 Barnbougle Dunes is a memorable golf course made by enthusiasts for enthusiasts. I easily would have been willing to make the journey to Bridport just to to see if the venue lies up to the expectations. Thanks to my girfriend studying in Sydney and some subtle, careful manipulation, the trip would actually take place: 9 days to spend on the wonderful island of Tasmania and 38 (!) holes tucked in one long, satisfying day at the links. First: the Dunes, then Lost Farm. When the day arrived, lots of rain had settled down in the sandy soil and the skies quickly turned blue, the caddiemaster laughed in my face when I asked him if he thought the wind might lay down at any moment: “No way, not a chance. Just a tough day out there”, I can still hear him resounding. I do already apologize for the amount of referentions to the conditions, but the design is built to a great extent with the wind in mind. How windy are we speaking? 8 Bft! Two blown away and never to be found headcovers, my big wheel trolley falling on flat surfaces, wedges into the greens on par 5s and more often than not, completely lacking the imagination to visualize a shot that would leave any perspective for the next one whatsoever. Still, I had a wonderful time absorbing the whole experience. I started off downwind at the tenth. The stretch from the 12th in particular is impressive and drop dead gorgeous in terms of the view. The 12th is a 254m par 4 that requires a perfect long carried fade off the tee to a small hilltop fairway and green guarded by a large bunker in the line of play. Visually, it’s a daunting hole for a first timer in gale winds. It really actually is hard though, don’t be fooled by the yardage. On more playable days, holes like these really show the masterful architecture by Doak. Barnbougle is a pretty short holes, yet test every club in the bag and there are so many options off the tee and into the greens. The greens are very undulated and will take many rounds to adjust to. I’m guessing half of the greens surface will never see a golfball stopping to move there. Knowledge of the lines and slopes really are key to hitting it close. The 14th is an interesting par 5. It’s a short one but it does not accept a running shot into the raised, long green. The fairway is really broad but it does not really show from the tee that deceives the view and tricks you into playing a shot down the right part of the fairway that slopes to the right and where you will find trouble lurking (or the odd kangaroo if you are lucky). It’s one of the half-par holes at Barnbougle. Oddly enough, this concept makes the golfers mind work overtime. Then we have arrived at one far end of the figure 8 lay out. The next hole plays right next to the water and into the prevailing wind. The tee shot is not the hard part, although there is a central bunker. Given the wind, the approach to the narrow green nestled on a large dune and the deep run off on the left, this one is not easy to pull off. All the holes on the back nine are of exceptional quality and feel balanced. The dunes have a similar feel to Tralee’s thrilling back nine. Everything just falls in place at Barnbougle a little bit more though. It is subtle and in your face at the same time and a very tough test for even the best golfers. The front nine at the Dunes is where the course really convinced me, even in the at that moment unplayable conditions. The wind took care of my decisions regarding the temptations on the 3rd and 4th holes, which are truly world class and often described. As is the walk from the 4th to the fifth tee. It will make you forget the score on the 4th, good or bad. Although the 7th is most people’s pick of the par 3’s, I really enjoyed the fifth as well. The green is really intriguing, with a slope in the middle to the back that makes it a game of roulette to which side of the green the ball will tumble. In a very good way however. It makes for tap in birdies as well as terrifying long putts with 180 degree turns and no intention of stopping anywhere near the hole. The 7th is a wonderful little par 3 as well, but unfortunately simply unplayable on the day. It does not need a storm to be nasty though as the green has a slippery false front and slopes from left to right as well, while deep bunkers are happy to punish the slightest of mistakes throughout the hole. Quite noticeably, the wind is a big influence in finding the slopes and the next thing you know, yous ball is in the exact same spot as it was two shots ago. Nowhere near the green. It’s got to be the hardest hole on the smallest amount of land in topgolf, measuring just 98 meters. The hole is easily the best of the finishing stretch. 17 and 18 are very solid par 4s with strategic options off the tee. I do advise to play the course the right way round, starting from the first tee, when you are a first timer at least. I do hope to return in more benign conditions. While the course feels and is stupidly good the first time, it seemed impossible to really catch everything what’s so great about it already. Another couple rounds I’m sure would make me rave about the sophistication and creative variety of the course even more. I find it quite hard to review the course. It is a course of contradictions as well. The course is rugged but manicured. It is forgiving and penal at the same time. It allows for bombing drivers but it remains very much a shotmakerscourse that rewards that favours delicate accurate play. Revenge and further insight in the secrets of Barnbougle will have to wait until a next trip to Tasmania. Cape Wickham will make for a proper excuse to make the journey again in the future. Time is precious, don’t hesitate and don’t forget to discover the rest of this remarkably special island while you’re at it! Barnbougle is amazing – you don’t need to hear again from me. I think the question is whether this is Tom Doak’s best effort in design. There is most certainly a strong argument for it. He really did win the lottery with the absolutely perfect, dramatic links landscape and sandy ground. What must have been the ideal canvas to route one of the world’s best courses. Barnbougle gives you a false sense of security with the semi although not too gentle handshake starting with a reachable par 5 depending of course on the sometimes very strong wind. For us it played downwind both days but I’m told this was an opposite wind which of course changes the tune on this one. The second hole begs you to challenge the left hand bunkers in order to have the best angle of approach into the highly undulated green. Again into the wind this hole would most likely mean the left hand bunkers were out of reach off the tee but the approach would be a very long and tough one. The 3rd is another excellent hole that calls for a cut off as much as you dare drive aiming over a dune ridge to very undulated fairway running left to right away from the tee shot at a diagonal line. The approach is also tricky to a front to back sloping green guarded by bunkers on the left side meaning there is a significant reward in terms of have the best possible angle into the green by successfully executing a tiger-line drive up the right. The 4th hole to me is where the course starts to simply blow you away. You’re faced with a short par 4, which was reachable with a 3 wood on the days we played due to the strong wind. The green is placed into a sort of bowl and tucked away behind a dune ridge that on our day was of course driveable. To do so you had to take on the huge blowout bunker fronting the green from the tee. Not a place you would want to end up. The risk of going for this green is mighty as there is no place to miss and avoid trouble so either you are on the green or you are in a bunker or seriously in trouble. That being said I still doubt many balls are lost here. The 5th hole is the first of the one shotters, little benefit we had from the huge tail wind now turned to brute challenge with this same wind straight into our face. This 180 yd hole playing from atop a high dune to a green tucked away between a couple other dunes which made for a near impossible target with a 5 club wind in our face, too much for me to pull of a satisfactory shot on the day. I hit 3 wood twice and would have even gone for driver had I thought I could control the ball flight – still what a great hole – don’t forget this one normally plays downwind. The 7th hole is the Tasmanian Devil version of the famous Scottish Postage Stamp at Royal Troon. At 110 meters a very short hole, which played to an extremely small raised and heavily guarded green with massive bunkers front left and sharp drop offs all around and trouble everywhere. So you stand there with a sand wedge in your hand knowing there is no way you can stop the ball on top of this green and trying to figure out how to minimize the damage. It’s 110 meters of pure evil in the wind. First time I’ve ever played intentionally to miss the green short and right just in hopes of being able to putt the ball up the slope and hope for the best. Mission accomplished one par and one bogey which felt like a major accomplishment. Walking to the 8th tee don’t think for a second that Doak or the wind would consider giving you a reprieve to catch your breath. The 8th is a massive par 4 playing 446 meters (straight into the gale on our day). Off the tee you face a massive dune to the right and a decision of which fairway to choose, left up over the ridge or right where there is far more space. I played one of my best drives into the wind, then an excellent 3 wood, then a rescue club all struck as well as I can. The approach was pretty steep uphill to a raised green with some bunker cover making it a brute of a hole into this opposite wind. The 400 meter 9th really finishes you off, it’s another tough 2 shotter that played as a par 5 on our day. A tough tee shot over a native area up to a rolling plateau in the fairway leaves a tricky approach to a green bunkered on 3 sides but susceptible to a front running approach. The finish is just behind and slightly above the clubhouse with a beautiful view of the coast. The back 9 really gets exciting with the 254m par 4 12th hole. On our day playing downwind I hit a 3 wood over the green which feels as though it plays slightly up hill and also seems a very risky shot with right being sudden death almost all the way to the hole as there is a severe drop off. The short par 4’s may well have been my favorite part of this course. The 188 m par 3 13th is characterized by a crazily undulated 3-tier green. Depending on the pin position there are all kinds of fun recovery shots that can be played with this green. We faced a back pin position and from the tee it was possible to hit past the pin and have it come back. I hit a 3 wood straight into the wind and almost holed it twice. On the way there and on the way back. Clearly I just needed it to roll past one last time. The par 4 13th is another stellar short hole at 322 m that plays up hill to one of the best naturally green complexes on the course. Left and short will roll all the way back down about 20m and leave an extremely tough recovery shot. The green is perched near the top of a large sand dune and protect by a huge front right blow out bunker. The finishing two holes at Barnbougle are both very strong at 400 and 403 meters. They play parallel to the coast and offer magnificent views to help you remember where exactly you find yourself. Yes, this is Tasmania! Yes, this is the middle of nowhere, yes this course is amazing and finally, yes, I can’t wait to get back there again! Barnbougle doesn’t let down those of us who expect Tasmania to be wild and woolly. It is an intriguing place to play golf and the opening stretch of holes is crazy good. It is hard to articulate in words how exciting the third, fourth and fifth holes are. They are a wondrous collection of back-to-back holes, as good as any stretch on any golf course. The fourth hole is difficult to describe accurately but is without question one of the finest golf holes ever built on the planet. A short par four, it plays only 254 meters, but into the prevailing wind. If the wind were not blowing or was blowing downwind, it would be a drivable green. The massive bunker on the right side of the fairway gets the mind going. I imagine plenty of shots are pulled left as the golfer panics at the last second thinking about the massive hazard, which is a naturally blown bunker. If you hit short of the large bunker you have a steep uphill shot that you can’t fully see. The second shot plays to an extremely well protected and crazy green. Although his inspiration for this hole was Royal Melbourne West's tenth hole, when Doak designed this hole he must have been on crack or some other kind of mind altering drug. It is a sick hole. The walk from the fourth green to the fifth tee is one of the finest in golf along Bass Strait. Plan on playing Barnbougle over and over again, it is so good and how often are you going to get to Tasmania? Stay at the rustic cabins and have a James Boag. Any plans to return and add Cape Wickham to the roster? Yes, I just read Darius Oliver's new Planet Golf writeup of Cape Wickham and am anxious to play it, along with other new Southern Hemisphere courses like Tara Iti and Lost Farm. Absolute Gem! Played here late last April first thing in the morning so as to get 2 rounds in that day. Unless you are visiting in the warmer months don't play an early tee time. The temperature is ridiculously cold prior to 9.30am and it's hard to concentrate on the golf in these temperatures.The golf course was much more enjoyable the second time around as many of the holes play blind from the back tees. The first round I was very much in awe of the beauty of this course however my golf suffered as a result of not knowing where I was going.The greens were bumpy at times and played particularly slow however this did not have a big enough impact to detract from my excellent rating.Looking forward to my next trip down! While walking to the first tee, I consulted the course guide I’d acquired in the clubhouse. On the first page was a brief description of the course, which began by announcing that, “In early Scotland the dunes were known as ‘link land’, as it linked the sea to the arable farming ground.” Raise your hand if you know that the word “links” is derived from the Old English word “hlinc”, meaning rising ground.I was further unimpressed by a sign at the fifth tee telling how the area was settled by a Scot who named it Barnbougle after his ancestral castle. The sign goes on to say that the castle was located “between Edinburgh and Leith where golf was first played.” While the Honourable Company of Edinburgh Golfers did play at Leith before moving to Muirfield, St. Andrews is universally considered to be the place where golf was first played. Raise your hand if you know the first written reference to golf at St. Andrews was in 1542, years before the first written reference to golf at Leith. Now look over your head. If both of your hands are there, you are a certifiable golf geek. While neither of the foregoing errors is an appropriate factor to include in rating the course, neither creates a positive experience. Tom Doak is a golf geek as well, but it seemed to me that the architect of Barnbougle Dunes did not get the better piece of land to work with. The front nine makes its way through a thin strip of high dunes and Doak struggled to make the best use of them. Once he had to move out into the bordering farmland and on a couple of occasions there are lengthy walks to the next tee. While I enjoyed Barnbougle Dunes, I didn’t think it was as good as his work at similar courses such as Pacific Dunes or Streamsong Blue. This, however, is not damning with faint praise, as there are any number of memorable holes. The fifth is a splendid tribute to the Punchbowl at Royal Liverpool, with the green set in a natural amphitheater. And at the ninth, Doak built a reverse Redan. The land on which the back nine is built is less dramatic, but fine linksland nonetheless. Here Doak’s fine work is on display hole after hole.Two other things I didn’t care for here:-There could have been greater variety in the holes. I began to wonder if Barnbougle Dunes had been co-designed by Rush Limbaugh. All but one of the many doglegs go right.-The conditioning left something to be desired. Golfers at Barnbougle are instructed to follow a practice unheard of in the rest of Australia—replacing their divots. And not all of them do. That, of course, occurs at every course, but there was no evidence that anyone on the greens crew had been sent out to sand this horde of divots. The bunkers were equally unkempt. I raked multiple footprints on each of my bunker visits……. with no evidence that anyone had been sent out to rake them. Nor were the greens good. After watching three straight putts bump their way to a halt short of the hole, I took out my stimpmeter on the fourth green to see just how slow it was. The reading of 7 is about the speed of a shag carpet. It was unfortunate that a round on such a fine course was not accompanied by fine conditioning. interesting words on what may be the first slightly critical review of the course here. you do indeed seem like a super geek! most people I know would describe many of the holes on the front 9 as 'all world' notably 3-8. in what ways do you think he failed to make full use of the dunes there? Hi Alan- Thanks for reading my review. I freely acknowledge a bias against long walks from green to tee……..hardly in keeping with the traditionalist approach I (and Tom Doak) favor. So as I slogged along in search of the 5th tee, I wondered why Doak didn’t place a par 3 along the dunes here. He could have built as fine a short hole there as he did at #7, and one with far lovelier views. Having eliminated that walk, he could have eliminated # 7 (I know, a sacrilege) and used the current 7th tee as the teeing ground for # 8, making it a par 5. You’ll be shocked to know I’m not a golf course architect, just a country boy from the U.S. who does not claim to know more than the esteemed Mr. Doak. But it did make me wonder. That said, I enjoyed the course greatly………it was the conditioning, rather than the architecture I found most lacking. Someone who carries about their own stimpmeter, I doff my cap to you sir! I always thought that the earliest reference to golf at St Andrews was an order that gowf was prohibited on Sundays as it was interfering with the archers practising their arrows, and this was 1457, I thought every golfer new that. 1457 of course. Thanks for the fix. It's only after playing more of the worlds great courses (18 of the Top 100 at present) that I really understand how magnificent Barnbougle Dunes is. I've played here seven times now over the last eight years and although the old saying is that 'familiarity breeds contempt', nothing could be further from the truth. Every round I finish here makes me want to return and play again. It's just that good.I'm fortunate to have family living in Tasmania, hence the regular travel, but even without that, I think I'd still want to get back there.Descriptions of the holes have been beautifully covered by previous reviewers, so I shan't repeat, but what I do want to remind everyone of is the value: AUD140 for 36 holes of golf. I'm not sure I've found better value anywhere in the world (maybe Royal County Down on the shoulder season rate? ).When I first reviewed this course I rated it with 5 balls. I'm correcting that mistake now! It's fair to say that most who make it here have to be pretty dedicated to the cause. Even for most Australians, a trip to Barnbougle still requires a couple of hours on a plane followed by an hour's drive. Starting from London, there can be few less accessible top class courses on the planet. But once you get here, you'll be glad you made the trip. As you arrive at this wonderful golfing outpost, your first glimpse of the course is of the fantastic par 4 10th, rising to an elevated green surrounded by waste bunkers on either side. Your appetite whetted, already you can be sure that you are in for something special. If you were unsure before, the warm welcome at the professional's shop confirms that this place exists to provide pure enjoyment of the game. The course is all about wide fairways, strategic bunkering, risk reward short par 4s, undulating greens and stunning scenery. However, if you do miss the generous fairways, then your ball is more than likely lost in the thick vegetation that covers the dunes. Therefore, a local rule treats the long rough as a lateral hazard. Despite being a relatively new course, Tom Doak has managed to make it look like it has been here for ever, with the waste bunkers giving the place a natural look. Standing on the first tee, you are faced with a drive through a valley. The uninitiated may fret about unseen dangers lurking on the fairway ahead. But fear not, the fairway is typically wide and, on this occasion at least, there is no sand to be found from the tee. Accurate approach play is key in the first two holes which, seemingly benign from the tee, are defended by greens which will repel anything short or off line, with potentially dire consequences. But it is from the 3rd where the course really takes off, as a beguiling short par 4 guides you into the towering dune complexes. The fourth is outstanding. Across a valley and 300 yards long, do you take on the enormous waste bunker and hope for a straightforward chip to the green (bearing in mind that anything off the fairway is probably lost), or play it safe with an iron into the valley below and then face a blind wedge to the green that now stands above you? The course then continues to wind its way through the dunes, offering options from the tee and confounding you around the greens. There is a great variety of short holes here - 5 is a superb par 3, 220 yards downhill to a gathering green, but it is the 7th that may live longest in the memory. Only 125 yards on the card, you may think that this offers a chance for an easy par or better. That is until you stand on the tee and see the upturned saucer of a green, perched above cavernous waste bunkers. It reminded me of some of the classic short holes at Sunningdale - but with far more severe punishment dished out to anything not finding the green. The back nine continues in a similar vein, with the 280 yard 12th a brilliant par 4, reminiscent of the the 12th at Royal St George's. The greens continue to provide lots of fun, with the undulations on the short 13th unlike anything you've ever faced before. There really isn't a weak hole to mention on this course. If I had to pick hairs, I might say that that I would like to see a first tee which is more open, making the challenge in front of you a bit more apparent. Perhaps the 1st and the 18th on the neighbouring Lost Farm are better opening and closing holes. But, all in all, there are few places where you will enjoy your golf as much as this, especially when you consider the green fee is just £60. Having come this far, we played twice, and enjoyed it even more the second time round. I’ve just been reflecting on Barnbougle after our visit to what remains my favourite course and wondering what, if any changes I might add if I had the magical power. I wonder is the 7th actually too hard? Surely a hole that only required a wedge could not fit that bracket! The thing is it’s just so difficult to recover if you miss the green anywhere other than short that even a bogey becomes a struggle and double/triple bogies must be common. The bunkers are so deep that holding the green is certainly not a guarantee and long is not much better. The area of the green that holds the ball is so small and the front portion is really a false front that takes balls back down the hill. Though on the other hand I suppose that is what gives the hole it’s power, and it’s funny to think you can be genuinely scared from 115 or so yards. To me it is a more stern test than the postage stamp and maybe perhaps only the second at Dornoch strikes more fear into a breeze, where a genuine case can always be made for the lay up. But at least that hole is closer to 150 yards! Maybe I would make the 16th green more of an effective punchbowl and add a bit of bunkering to the right of the green. Yet again though the course was fantastic, and it just never gets old. Its great how a hole like 11 can be infinitely wide and appear like the most simple of tasks to par yet get too conservative as I did and you are left with a far too difficult chip that make you regret being such a wimp. Well it just keeps getting better. My group has been coming back to "Barny Dunes" since it opened. This is a world class golf experience in every way - getting there is part of the fun, the accommodation simple but more than adequate, the food the best value for quality golf course food in the country and the golf course..... well, in my view this is in the best 2 or 3 courses in the country, and one of the other 2 is just over the river. What a pair these courses make. The BBD stretch from 3 - 8 is just great. The whole absolutely world class, without a weak hole. The putting experience on 13 worth the trip by itself. Australia is indeed fortunate to have these courses on our doorstep. Congratulations to all involved for their foresight in giving this to the world. Tasmania now has world class sporting and cultural attractions at both ends of the island ( suggest if you can visit MONA in hobart on your way to Bridport). Barnbougle Dunes is not an easy course to get to but it is well worth the journey to the Tasmanian north shore. Tom Doak was handed some ideal golfing land to work with and he’s delivered a genuinely world class layout. In the modern style the fairways are extremely generous and are littered with huge and very natural looking waste bunkers. Although the fairways are hard to miss at times the undulating green surrounds certainly favour tactical positioning from the tee. The course opens with a fairly straight forward par 5 which offers a risk/reward 2nd over a large blowout fairway bunker and the challenge of the green surrounds is quickly apparent. The 2nd is a difficult long par 4 favouring an approach from the right side and where anything left or short requires deft chipping skills with the onus clearly on the ground game. The stretch of holes from 3 to 7 are the most memorable on the course and show Doak at his best. Hole 3 is a great short par 4 which dog legs right and where the line from the tee is a total mystery. A bail out left leaves a longer approach to a narrow and well-guarded green with a drive down the right offering an early birdie opportunity. Much is made of the 300 yard 4th and it certainly lives up to the hype. An elevated tee plays towards an enormous waste bunker covering a large dune. A clean, straight drive will fly the bunker and funnel down to the green but anything left will find a second deep bunker or some very healthy rough. Shot selection is almost entirely dependant on the wind and the green should always be in play downwind but appropriately the severely sloping green does not give up single or two putts easily. Along with the brilliant 3rd at Castle Stuart this is one of the best short par 4s I have played. The 5th is the first par 3 and is played from the top of a dune to the valley below. With everything kicking in from the left all you need to do is ensure your judgement of distance is up to scratch and then watch as your ball hopefully meanders its way down towards the pin. The 6th hole is a great 415 yard par 4 which plays through a valley of tall dunes comparable in scale to those at the new Trump course in Aberdeen. The drive must be placed to the left of a huge shaggy dune and again the wind direction plays a huge part in the playing length of the hole. It’s a beast of a hole into the wind as although there are no greenside bunkers the shot to the green is made far easier the closer you are to it. The next hole is the best single shotter on the course and also one of the best that I have ever played. From the tips it is a monstrous 123 yards but the postage stamp green is exceedingly difficult to hold due to the encroaching slopes which would make Donald Ross proud. The deep greenside bunkering complete with large chunks of overhanging turf actually seems to be an appealing miss as even 2nd shots to this green are not guaranteed to hold on. The stand out holes for the rest of the course for me are 12, 13, 15 and 17. The 12th is another great short par 4 where the tee shot must be played left to avoid a steep drop off right. Although drivable in theory it seems the drive must be a well struck fade and again the green is tiny with small but steep slopes around the back and left side. The next is a great par three of over 200 yards but playing much less from an elevated tee. This hole is all about the green which slopes back to front over and around numerous large swails. Again there is great anticipation in awaiting the ball’s finishing position as anything at the back of the green is virtually assured of requiring three shots more to locate a front pin. 15 is played from one of the most scenic tee locations on the course with Coore & Crenshaw’s Lost Farm course visible just 100 yards away across a river. With a double fairway left there is no fear with the tee shot but the further left you go the more you have to carry a deep gully that cuts across the left side of the green. 17 is a long par four which again plays from an elevated tee to an undulating fairway which moves right against the dune line. The drive must split 2 bunkers and the second must be purely struck in order to find the elongated green. Again the greenside undulations ensure that nothing is taken for granted until the ball is holed. The Barnbougle experience is just about golf, pure and simple. There is nothing extravagant about the facilities and considering a round costs about £65 it is probably the best value ticket around – you just have to get yourself there!